Not too long ago, I wrote a post on Gorgut‘s seminal album Obscura. In it, I suggested that Gorguts, in their almost painful need to innovate, stretched the metal envelope to the point of outright rupture. It is a position I continue to maintain with some conviction, but from the same contrarian standpoint also rises a spectre that taunts me every time I become excited over a technically accomplished band unafraid to go off the beaten path. Why Gorguts and not them, it asks in smirking tones. Be consistently conservative, it admonishes; if you are to make a virtue out of orthodoxy, says this devil’s advocate, then what chance does any adventurous metal band have of breaching your stubborn, self-imposed defenses? Such questions have persistently dogged me since I first heard Zealotry‘s new album, but I am happy to report after an extended and somewhat obsessive acquaintance that The Last Witness is a masterwork of technical death metal fit to be counted on its own in any august league you care to name. This is ambition and execution on a scale that boggles the mind, but what may initially seem like a soulless, robotic marching drill gradually reveals layer upon never ending layer, to the point when one comes away nearly short of breath at the artistic and emotional tapestry of it all. It is cliche to borrow the reviewer’s old chestnut, that of an album requiring multiple listens to sink in, but it was never so well deserved as in this case. 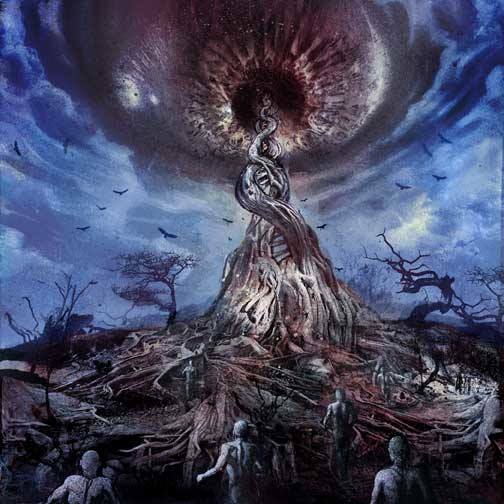 Zealotry used a rare kind of percussive musical phrasing on their debut, reminiscent of the likes of Demilich, Atrocity, and Immolation, but out of vogue with much modern death metal. The sheer richness of tone and color on The Last Witness, however, surpasses The Charnel Expanse and everything else being done in the genre today. Incredible detail in inflection possesses every second of this album; even the avant garde parts, in other hands liable to raise eyebrows, form an indispensable part of the storyline, both musical and as gathered from the lyrics. Bear in mind that Zealotry don’t play any form of linear, straight-laced death metal. This is an innately twisting take on the genre, full of counterpoint and string articulation and tempo maneuvers. Melodic flourishes are of the dark, uncompromising variety as well, including a jazz-touched, legato-dominant soloing style that brings to mind the great Allan Holdsworth (also found in Norwegian band Diskord‘s work). Many-chambered pieces, alternating between death metal on the one hand, and spoken word, choirs, ambient soundscapes, intermezzos and segues on the other, create an entire universe of clashing components with no right to exist in harmony but doing just so. In my post on the post-modern Gorguts are listed the seven qualities that all metal should possess in some amount. These were the source of my consternation on first hearing The Last Witness, in how they would apply to an album as willfully dense as this. I needn’t have worried; the seven-step charter not only applies to Zealotry, but they come to define it for metal in the modern age. This entry was posted in Death Metal and tagged The Charnel Expanse, The Last Witness, the post modern Gorguts, Zealotry. Bookmark the permalink.